Current presentation tools do a good job creating the final slides of a presentation. But where they fail in my opinion are the steps required before you should finalize your slides: coming up with a compelling outline and initial sketches of the slides. I am not alone with this opinion, many presentation experts recommend NOT to use PowerPoint or similar tools while creating the initial design of a presentation. Slides created with PowerPoint are too polished. Creating beautiful, pixel-perfect slides is great for your final slide deck, but it is a dangerous trap during the early stages. For example in the beginning it makes sense to create several sketches of your slides, gather feedback, and select the best one. Unfortunately a tool that supports only polished slides seems to effectively prevent this kind of approach. Instead you feel tempted to create the perfect slide right from scratch. Also when you spend a lot of time on each slide during the initial design, it is very easy to loose the overall picture of your presentation. A better approach in my opinion is to use a “sketch mode” in the beginning and a “pixel-perfect mode” in later stages. 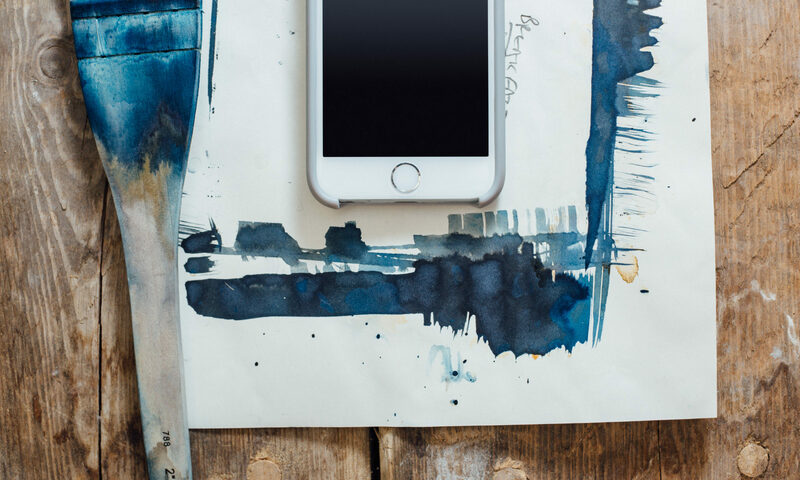 This would allow you to create quick sketches first, which can later be refined to the final slides. The sketch mode would only support a limited set of tools and few colors. This forces you to stay away from time consuming polishing tasks and focus on what is really important: the content. Enough has been written about how bad bullet points are for your presentation. But yet in current tools they still seem to be the preferred choice. Just take a look at fig. 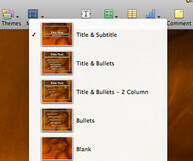 1, which shows an excerpt of Keynote. You can see the templates that are available for a new slide. Of the first four templates, three contain bullet points. Or take a look at fig. 2, which shows a template from LibreOffice. See the large text saying “Click to add text” – that creates a bullet point list. And do you see the four tiny icons in the middle. Pressing one of these would give you other content. The emphasis is obvious. A better presentation tool should make it obvious that bullet points are only acceptable as rare exceptions. And doing anything which makes your presentation better, e.g. adding a full screen image, should be at least as easy as adding a bullet point list. Current tools easily mislead you into creating your presentation linearly. 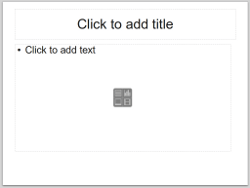 Typically users start with the title slide and add new slides successively until they reach the last slide. Obviously this can only work very well, if you already have a good idea about the structure of your presentation and which slides to include. But when you create a new presentation, you do not have this clear picture yet. Instead you typically have some random ideas: maybe a funny anecdote that fits in, some interesting statistics to prove your main point, a famous quote you want to include etc. And you usually have no idea how to structure all of these ideas. One can certainly change the order of the slides at any point in PowerPoint et al., but this feels more like an afterthought, the correction of an error, while appending slides to the end of the presentation feels like the default operation. In a better tool, collecting ideas and working with them in any order should be the norm, working on your ideas linearly should be the exception. The initial focus of current tools is distracting, if not misleading in my opinion. What are the first questions you have to answer in most tools? It is typically either the title and/or the theme of your presentation. While these details are certainly important for your presentation at some point, it is usually of little interest when you start a new presentation. Once you have a good idea of the content, these questions are much easier to answer. A better start would be to ask for information that really matters in the beginning, e.g. “What is the key message?” and “Who is your audience?”. Knowing the answers to these questions helps tremendously to create a good presentation with a clear message targeted at your audience. Current tools do not give you any guidance. Basically you are left alone with an empty screen and a bunch of tools to add content. What would help tremendously in my opinion are some recommendations and explanations from the tool. For example a short paragraph about what a good opening should contain would make it a lot easier to create a good opening. Creating good presentations is hard. Statements like “Do not blame the tool, users are just lazy” make me sick. Users are not lazy, they are just very busy and experts in other areas. It is true, at the end of the day it is the user who creates the presentation, but current tools could do a lot more to support them. And that is basically why I started a crowdfunding campaign for a better presentation tool. Great thoughts – we are kindred souls in a way as these are the exact type of things that we found problematic with Presentation tools today. Like you are attempting to do, my team has also built a tool that provides a new way to create presentations…still early days but we have a version here – http://www.deck.in – do take a look if of interest. Very slick and stylish. Just downloaded and tried it (the iPad version). I have tried Prezi, but it did not really convince me. First time you see a presentation done with Prezi, you think “Wow, this is awesome!”, but the effect wears off quickly. Overall I think presentations done with Prezi are neither better nor worse than “normal” presentations. Prezi has a huge fan base, it seems to work for a lot of people.